The echoes already can be heard throughout United Spirit Arena. "We want Hoff!" "We want Hoff!" "We want Hoff!" The chants will be for Tyler Hoffmeister, but the winner of Knight School still has some work left to do before the dream can become a reality. 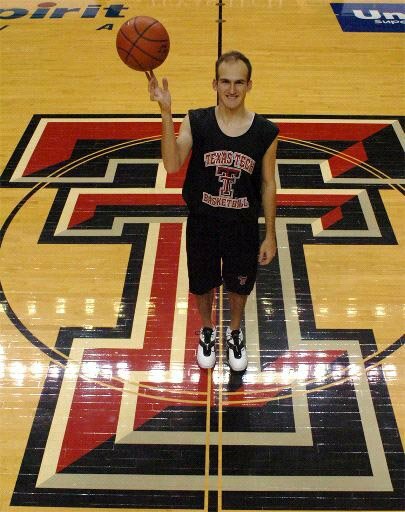 Hoffmeister's biggest secret was revealed on Sunday during the season finale of "Knight School," the reality show that gave Texas Tech students the opportunity to compete for a walk-on spot for next year's men's basketball team. "I watched all the shows and at first it was surreal seeing yourself on television," said Hoffmeister, who along with the other contestants, was only allowed to speak to his parents about the show or face a $3 million lawsuit. "To see what the rest of the country could see kind of puts you on the spot." Hoffmeister played basketball in high school at The Woodlands. A starter his senior season, the 6-foot-6 forward received some interest from Division III and junior-college schools. He opted to go to Tech for academics and he's a junior completing his degree in pre-medicine. After discussing the opportunity with his parents, weighing the options of playing basketball or focusing on studies, Hoffmeister signed up for the show, one of about 140 who initially entertained thoughts of playing for Knight. "Over the course of the last two weeks (of the show), we based our decisions on who would be best suited to play for us," Knight said. Hoffmeister outlasted the field, which included the other finalist, Dustin Richardson. "I had fun on the show ... It was a great experience for me. "My first love is baseball and it's where the future lies for me with a chance to play professionally. Basketball is another love, and to have a chance to play for Coach Knight and with the other players would have been awesome." Knight said he expects Hoffmeister to begin working out with the team this spring. Hoffmeister, who is from Houston, said he plans to remain in Lubbock over the summer to continue workouts with the Red Raiders, which should include several new faces after the April signing period. As for the show, executive producer Rob Lundgren said the ratings for the first five shows continued to increase, reaching a peak of .93. He said the ratings were higher than what they were sold for to advertisers, which is pleasing to all involved since the show was put in a difficult time slot. Knight said he only watched about 15 combined minutes of the show, but the feedback he's received has been nothing but positive. "The thing I liked is that I had nothing to do with it," Knight said. "I didn't tell them what to put in, what not to put in, that was all done by the editors. And from a feedback standpoint, everybody said it was good." Hoffmeister also said he liked the editing, though there were certain things he would have liked to have seen aired that didn't make any of the shows. The toughest part for him may have been keeping the secret for the last five months. "It was pretty hard walking around knowing this big secret that a lot of people at Texas Tech were waiting to find out," Hoffmeister said. "Once school began again this semester and the show started, some people came up and asked questions, but I just played dumb and kept a straight face." Now that the secret's out, Hoffmeister has changed his plans for the future. He attended some of Tech's practices this season and will begin working out with the team. He's also had to adjust his schedule to fit in playing basketball, working out at the gym while also keeping up with his studies. He said his life hasn't changed much yet, but he knows it might. "I just want to be able to work hard and help the team in practice," he said. "If I get in a game to give someone a rest, that's great. I just want to be able to contribute to the team."